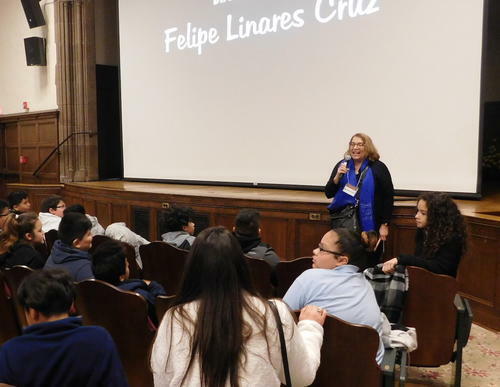 More than 200 students from the New Haven public schools attended the 9th annual Latino & Iberian Film Festival at the Whitney Humanities Center on November 8 and enjoyed a private screening of La Formula del Doctor Funes, a children’s film by Mexican filmmaker José Buil. The students who attended the screening ranged from elementary school kids who are excited to hone their Spanish to high school students who are learning English as a second language. Viviana Ortiz, a dual language instructional coach at John C. Daniels elementary school, said that she was excited to bring 72 students from her school to watch a film specifically selected for childrens’ viewing pleasure. For DD Hamilton, teacher of English to speakers of other languages (TESOL) at Hillhouse High School, the Film Festival is one among the many favorite field trip activities she takes her ESL students to each year. “My parents were both professors. My father took me to events at Yale all the time, and it’s something I want to pass on to my students. I take them to events at the Peabody [Natural History Museum], the art museum, and walking tours to see the statues [around New Haven].” She said that the film being screened explores the themes of appreciation for the community and is a great match for the current theme of her ESL class. Margherita Tortora, executive director and founder of the Festival, explained that the selection committee works closely and personally with filmmakers, actors, and producers, to create a program that succeeds in promoting cultural awareness and understanding. This year’s selection committee includes Rosario Caicedo, who is a retired New Haven social worker and lifelong cinephile; Nils Longueira Borrego, a graduate student at Yale and a film critic; Celia Rodriguez Tejuca, former programmer for the Young Cuban Filmmakers Showcase in Havana; as well as Margherita herself, Senior Lector II of Spanish at Yale. “The director of this film, José Buil, would be happy to know that his film is appreciated,” said Tortora, in midst of enthusiastic applause. She snapped a photo of the excited crowd and looked forward to sending it to the filmmaker. When asked if she is in touch with all the filmmakers featured at the festival, Tortora nodded with a bright smile. And indeed, that personal touch and devotion shows in every aspect of the event. The 2018 Latino & Iberian Film Festival ran from November 7-11 and screened 18 feature length films and 25 short films, all free and open to the public. In addition to other sponsors, LIFFY is supported generously by the Edward J. and Dorothy Clarke Kempf Memorial Fund. The LIFFY program can be found on its website.